Europe with a performance at the Salle Fado in Paris, France. The string of gigs on that continent will see him making 19 stops across nine countries -- France, Germany, Austria, Spain, Belgium, Switzerland, Sweden, Italy and The Netherlands -- before it culminates in Rotterdam, on November 8. The stops will see the Clarendon-born artiste performing in some of the major cities in these countries. 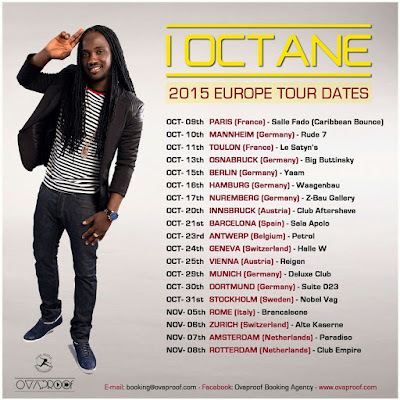 I-Octane told the Jamaica Observer that he is looking forward to returning to Europe, a major market for his brand of reggae. "I have matured as an artiste and expanded my repertoire and I'm looking forward to sharing that with my European fans. I am also going as a solo act this time and that is a great accomplishment for me," he said. For him, Europe holds a pride of place due to the loyalty of the fans on that side of the 'pond'. "Europe has done a lot for artistes in general, not just for reggae. Even though each market has its own unique advantages, Europe is one of those places that is extremely loyal. Once they accept and love you, they love you for life. It doesn't matter whether you are current or considered to be in the top 5. Europe is more focused on the music itself instead of the hype that surrounds it. That is important in an industry where great talent can easily be overshadowed by other things. It is great that there is a place that is always willing to accept and stand by positive music," I-Octane explained.